Elizabeth Batts Cook (4 February 1742 – 13 May 1835) was the wife and widow of Captain James Cook. She was the daughter of Samuel Batts who was keeper of the Bell Inn, Wapping and one of her husband's mentors. She married James Cook at St Margaret's Church, Barking, Essex on 21 December 1762. The couple had six children: James (1763–94), Nathaniel (1764–80, lost aboard HMS Thunderer which foundered with all hands in a hurricane in the West Indies), Elizabeth (1767–71), Joseph (1768–68), George (1772–72) and Hugh (1776–93), the last of whom died of scarlet fever while a student at Christ's College, Cambridge. When not at sea, Cook lived in the East End of London and the family attended St Paul's Church, Shadwell, where their son James was baptised. After her husband was killed at Kealakekua Bay, Hawaii in 1779, Elizabeth Cook received an annual pension of 200 pounds from the Admiralty. In 1788, she moved to Clapham, Surrey. 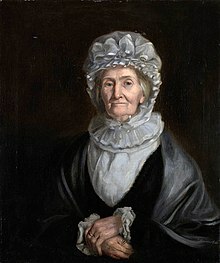 Outliving her husband and children, she died on 13 May 1835 at the age of 93. Elizabeth Cook was buried in St Andrew the Great church in Cambridge with her sons, James and Hugh. She left a bequest to pay the minister, support five poor aged women and to maintain the family's monument. Cook has no known direct descendants — all her recorded children predeceased her and died without issue. A small memorial garden fountain was dedicated to Elizabeth Batts Cook on 27 February 1971 within the grounds of the E. G. Waterhouse National Camellia Garden at Caringbah South, NSW Australia. This garden is located within the Sutherland Shire, which also contains the place of Captain Cook's first landing on continental Australia at Botany Bay on 29 April 1770. This fountain commemorates the life of Elizabeth Cook, wife of the famous navigator Captain James Cook. It is believed to be the only monument in the world to this woman of formidable courage and character. Born Elizabeth Batts in 1742, she married James Cook on 21 December 1762 when she was 20 and he was 34 and already making a name for himself in the Navy. They were married for 17 years but lived together only about four years in total in between Captain Cook's three epic voyages of discovery. They had six children, two of whom died as infants: George aged four months and Joseph one month. Their only daughter Elizabeth died at the age of four. Captain Cook's death in February 1779 heralded a string of tragedies for Mrs Cook. Eight months later their son Nathaniel, 15, was lost at sea when his ship went down in a hurricane. Her remaining sons, Hugh, 17 and James, 31 died within weeks of one another in December 1793 and January 1794 - Hugh of scarlet fever at Cambridge, where he was a student, and James a Commander of the Royal Navy, who drowned. The shock of these deaths confined Mrs Cook to her bed for two years and forever afterwards she observed four days of solemn fasting on the anniversaries of her bereavements, staying in her room praying and meditating with her husband's Bible. Mrs Cook was known to be a skilled needlewoman and at the time of her husband's death in Hawaii she was embroidering a waistcoat for him to wear at court. 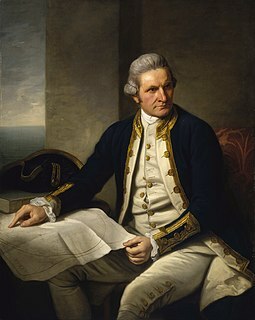 The unfinished garment is exhibited at the Mitchell Library in Sydney along with Cook's relics, including the original grant for Captain Cook's Coat of Arms, awarded posthumously to his descendants in 1785. Mrs Cook lived for another 56 years after her husband's death, and one of her proudest possessions was a gold medal, struck in his honour by the Royal Society. Her portrait, painted when she was 81, depicts a handsome, venerable lady with an oval face and an aquiline nose dressed, as always, in black satin. She wore a ring with a lock of her husband's hair in it and she entertained the highest respect for his memory, measuring everything by his standard of honour and morality. Her keenest expression of disapprobation was that Mr Cook - to her he was always Mr Cook, not Captain Cook - would never have done. Before her death on 13 May 1835 at the age of 93, Mrs Cook went to great lengths to destroy all her private papers and correspondence with her beloved husband, considering them too sacred for other eyes. She was buried in the family vault at Great St Andrew's Church, Cambridge, between two of her sons. ^ a b c Biographical Notes on Elizabeth Cook Memorial Fountain. Caringbah South, NSW Australia: E. G. Waterhouse National Camellia Garden. ^ "St Andrew the Great Church, Cambridge". Captain Cook Society. Retrieved 13 August 2017. ^ Dedication Plaque of Elizabeth Cook Memorial Fountain. Caringbah South, NSW Australia: E. G. Waterhouse National Camellia Garden. ^ Monument Australia. "Mrs Elizabeth Cook". monumentaustralia.org.au. Retrieved 18 October 2016. Mary Anne (Fanny) Stirling was an English actress renowned for her comedy roles in a career for over fifty years. Sir Terence Aubrey Murray was an Australian pastoralist, parliamentarian and knight of the realm of Irish birth. He had the double distinction of being, at separate times, both the Speaker of the New South Wales Legislative Assembly and the President of the New South Wales Legislative Council. From 1837 to 1859 he owned the Yarralumla estate, which now serves as the official Canberra residence of the Governor-General of Australia. Elizabeth Macarthur was an Anglo-Australian pastoralist and merchant, and wife of John Macarthur. Gunbar is in the Riverina district of south-western New South Wales in Australia, on a wide bend of the Mid-Western Highway between Goolgowi and Hay. It is part of the Carrathool Shire local government area, administered from Goolgowi. At the 2006 census, Gunbar had a population of 97 people. The Garden Island Naval Chapel is a heritage-listed non-denominational Christian chapel located in the heritage-listed Garden Island Naval Precinct that comprises a naval base and dockyard in the inner eastern Sydney suburb of Garden Island in the City of Sydney local government area of New South Wales, Australia. Housed in a building designed by James Barnet and built between built 1886 and 1887, the chapel was established in 1902 after conversion from the former sail loft and is the oldest Christian chapel of the Royal Australian Navy (RAN) and has stained glass windows and plaques from that era to the present. The chapel was added to the Commonwealth Heritage List on 22 June 2004 and the New South Wales State Heritage Register on 12 November 2004. The Camden Park Estate incorporating the Belgenny Farm is a heritage-listed large working historical farm located at Elizabeth Macarthur Avenue, in the south-western Sydney suburb of Camden South in the Camden Council local government area of New South Wales, Australia. It was designed by Henry Kitchen in c. 1800, John Verge in c. 1835 and A. J. Onslow in c. 1888 and built from 1819 to 1840 by John Macarthur in c. 1800, James English and Sons in c. 1888 and John Sulman c. 1895. It is also known as Elizabeth Macarthur Agricultural Institute (EMAI) and Menangle Paddock. The property is owned by Belgenny Farm Trust and Camden Park Preservation Committee. It was added to the New South Wales State Heritage Register on 22 December 2006. Today, part of the original estate contains the Elizabeth Macarthur Agricultural Institute; having originally served as a commercial sheep station and horticultural farm for the Macarthur family since the early 1800s. Caringbah South is a suburb located on the Port Hacking coastline in southern Sydney, in the state of New South Wales, Australia. It is located 25 kilometres south of the Sydney central business district in the local government area of the Sutherland Shire. Zara Eileen Hore-Ruthven, Countess of Gowrie was the Irish-born wife of the 1st Earl of Gowrie, Governor of South Australia 1928–34, Governor of New South Wales 1935–36 and the longest serving Governor-General of Australia 1936–44. She was renowned for her work in promoting the welfare of children in Australia, and the Lady Gowrie Child Centres were named in her honour. Eryldene is a heritage-listed former family residence and now house museum located at 17 McIntosh Street in the Sydney North Shore suburb of Gordon, Ku-ring-gai Council, New South Wales, Australia. It was designed by William Hardy Wilson and built from 1913 to 1936 by Rudolph G. Ochs. The property is owned by The Eryldene Trust. The house and its garden, which is noted for its camellias was added to the New South Wales State Heritage Register on 2 April 1999 and was listed on the Australian Register of the National Estate. Louisa Lawrence was an English horticulturist in the second quarter of the 19th century. St Andrew the Great is a Church of England parish church in central Cambridge. Rebuilt in late Gothic style in 1843, it is a Grade II listed building. The church has a conservative evangelical tradition and participates in the Anglican Reform movement. The congregation includes Cambridge residents, overseas visitors and students. Eben Gowrie Waterhouse OBE CMG (1881–1977) was an Australian who had three distinguished careers. Starting out as an innovative teacher of languages, he became one of Australia's most prominent Germanists when classical German culture still commanded worldwide respect. Between the Wars in Sydney he was a leading arbiter of taste in house-and-garden living, fostering a conception of garden design which still dominates much of the Sydney North Shore and parts of Melbourne. Finally, in his long retirement he brought about, as scholar and plant-breeder, an international revival of interest in the genus Camellia. Melicent Knapp Smith was an American educator and Christian missionary in the Hawaiian Islands. She was a member of the Tenth Company sent to the islands by the American Board of Commissioners for Foreign Missions in 1841.